In The New New Look, Part 1, I detailed the changes we made to the BeamAndGo Store page. 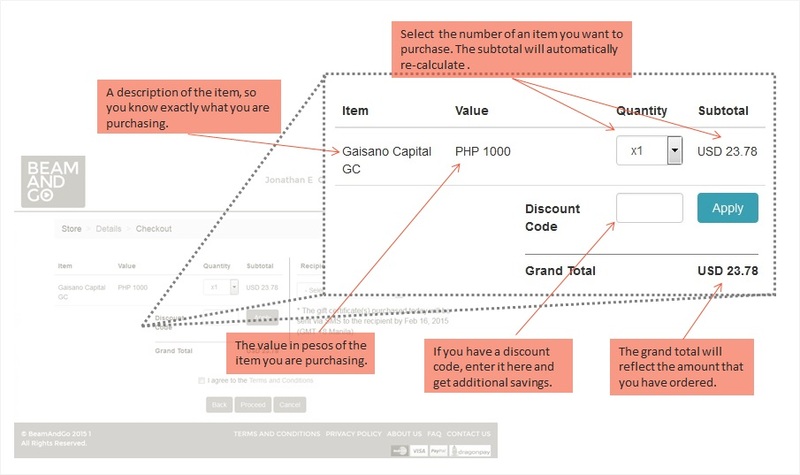 In Part 2, I described the Details page that appears after a user clicks on the Buy button. In this post, I will show you all the payment options that are available to our users on the BeamAndGo Checkout page. PayPal is one of the world’s largest internet payment companies in the world. They operate in over 200 markets and allow customers to send, receive, and hold funds in 26 currencies worldwide. We accept Visa, MasterCard, American Express and Discovery Card. 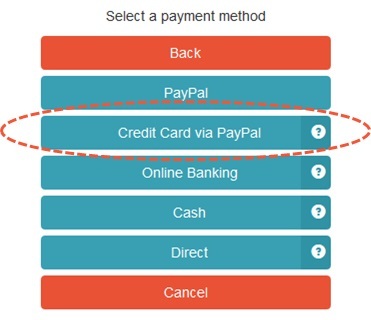 Our credit card payment service is provided by PayPal. 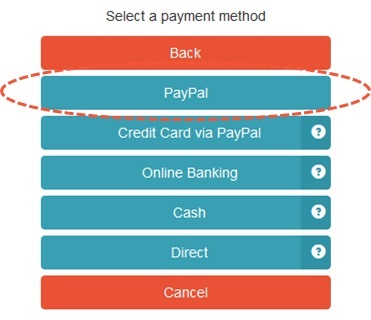 As long you have one of the credit cards listed above, you do not need a PayPal account. With our partners DragonPay, we enable our users to use online banking to pay for their BeamAndGo purchases. The following are the participating banks in the Philippines: BDO, BPI, Metrobank, RCBC, Unionbank, UCPB, Chinabank, PNB, Maybank, RobinsonsBank, Sterling Bank of Asia, and EastWest Bank. Also with DragonPay, we are able to accept cash payments for BeamAndGo purchases at banks and retail establishments all over the world. The following are the participating retail establishments in the Philippines: Bayad Center, LBC branches, SM Payment Counters, Robinsons Department Stores (RDS), Cebuana Lhuillier and M.Lhuillier branches nationwide. Internationally, I-Remit provides payment centers accepting cash payment for BeamAndGo purchases in over 20 countries. 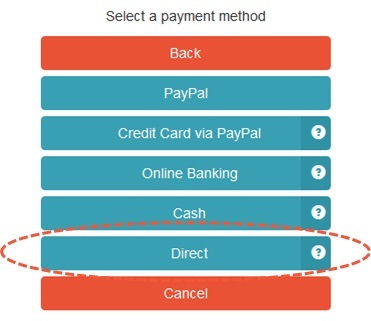 For our users who live in Manila or Singapore, we provide an extra payment option – BeamAndGo Direct. With BeamAndGo Direct, a user can visit our office in Makati or in Singapore and make a payment directly to us. Or you can call me at +65 9129 4273 or email me at jonathan.chua@beamandgo.com to arrange a meetup. And we are working hard everyday to provide more payment options. Within the next few months, BeamAndGo users will be able to pay for their purchases with Bitcoin or charge their purchases to their mobile phone account. We want to make it easier for our users to take care of their families in the Philippines. If you have any suggestions or comments, you can contact me directly at jonathan.chua@beamandgo.com. To see the new changes at BeamAndGo, visit us at http://www.beamandgo.com/store. In The New New Look, Part 1, I described the changes we made to the BeamAndGo products page in order for our users to get all the product information at a glance. In Part 2, I will show you guys what happens after a user clicks on the Buy button. First, we created a section that displays all the item details related to the order. 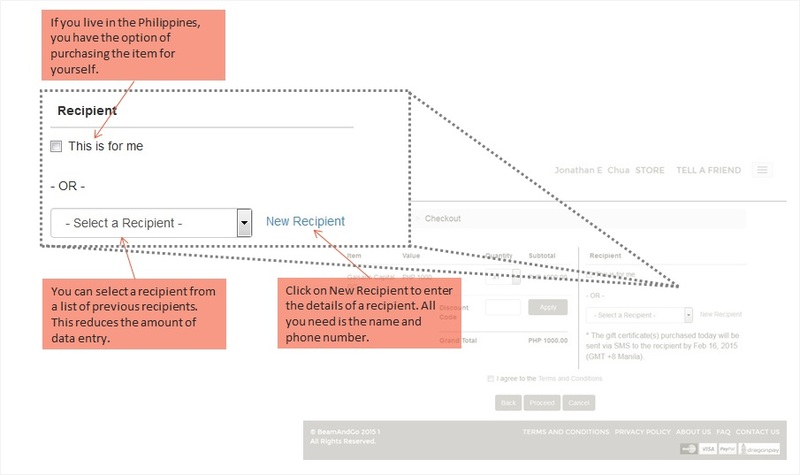 Then, we made it easier for the user to select a recipient for the order. And lastly, we provided an estimate on when the recipient will receive the SMS with the digital gift certificate information. The SMS will contain the following information: the sender’s name (you! ), the value of the gift certificate, the gift certificate code, the merchant and the locations where the gift certificate can be redeemed. In many instances, the SMS will be sent instantaneously and the recipient can redeem the digital gift certificate immediately. In The New New Look, Part 3, I will explain the different payment options we have added to BeamAndGo to make it easier and more economical for our users to provide for their families. To see the new changes at BeamAndGo, visit us at http://www.beamandgo.com/store. If you have any questions or comments, you can contact me directly at jonathan.chua@beamandgo.com. Everyday we ask BeamAndGo.com users how can we make it better for them to take care of their families in the Philippines. Because we are a new to the scene, our users wanted more clarity about our products and our services. So that’s what we did. Last week we unveiled a new look that provided our users with the essential product information and features that will help them make better decisions as they provide for their families. We are calling this new look BeamAndGo Store. Bread Crumb – In the upper left hand corner, we left a bread crumb trail: Store > Details > Checkout. 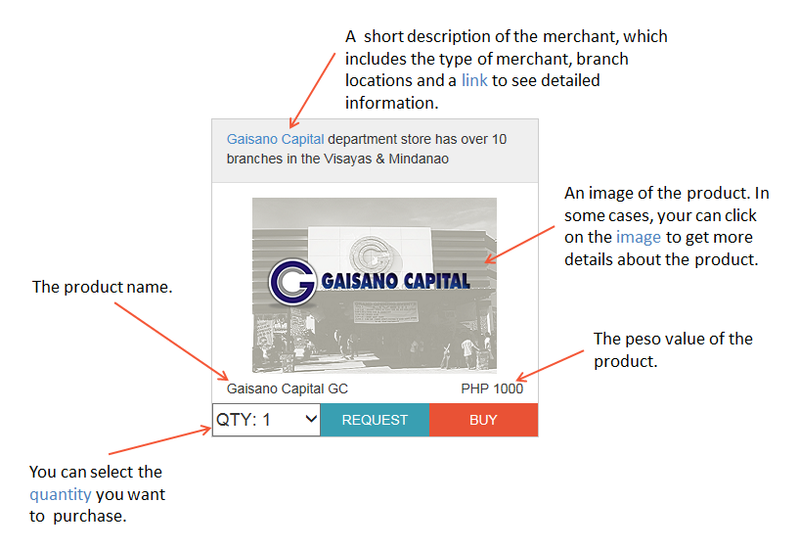 The bread crumb enables our users to know how many more steps are in the purchase process. 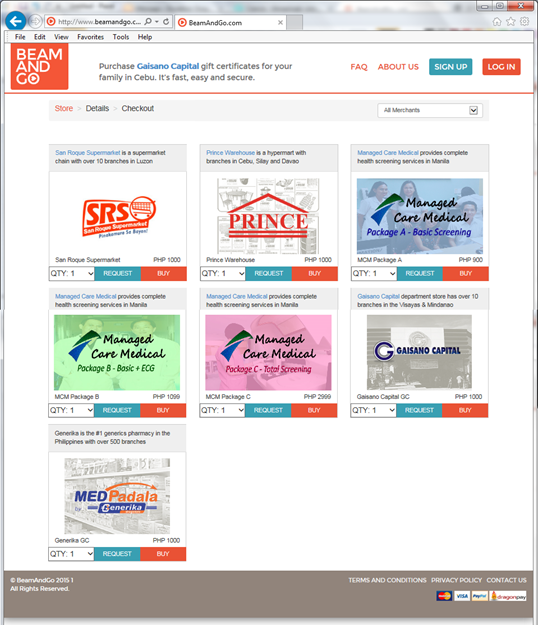 View by Merchant – In the upper right hand corner, a drop down list displays a list of BeamAndGo merchants. When a user selects a merchant, the system will display all the products offered by the specified merchant. In The New New Look, part 2, I will explain how we made it easier for our users to select their recipients, apply discount codes, and understand the delivery options.